2015 Year of the Sheep... What Will It Bring?! 2015 is the Year of the Sheep, you will also see it referred as the Year of the Goat, and on occasions also as the Year of the Ram. In Chinese we use the same general term yáng for these animals. This is the Year of the Green or Wooden Sheep to be more precise. So what does it mean? 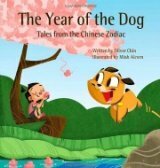 Each of the twelve animals in the Chinese Zodiac has unique characteristics and each year corresponds to one animal. 2015 corresponds to the Sheep. In 2015, the corresponding element is Wood. Wood by its very nature, is the element associated with all living things, the "spring" or life renewal process. The Year of the Sheep follows a tumultous Year of the Horse, and heralds a more calm atmosphere. Combined with the evergreen and renewal characteristics of Wood, the Sheep's creativity will be unleashed. If last year was the Horse's year to gallop and take off, this year will be the year for contemplating and appreciating what has already been accomplished, to think about bringing goodness to others, to take a deep breath and calmly look at what's ahead. A steady path, generosity, and keeping the peace are this year's mantra. 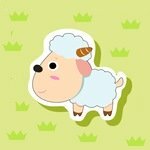 If your baby is born in the Year of the Sheep, he or she will assume the characteristics of the Sheep: Sheeps are kind, elegant, creative, loyal. Empathy comes natural to sheeps, their happiness is derived from other people's happiness. Sheeps avoid confrontation and are not born leaders. It is because of these characteristics that being born in the Year of the Sheep is not that highly regarded by some Chinese who prefer the energetic and dynamic characteristics of some of the other signs, like the Dragon, Tiger and Horse. However, the Sheep is the 8th sign of the twelve animals in the Chinese Zodiac, 8 is the lucky number for the Chinese, and being born under the 8th sign is auspicious indeed, and who wouldn't want their child to be kind, forgiving and loyal? Sheep babies are good-hearted and will always look after everyone else first. 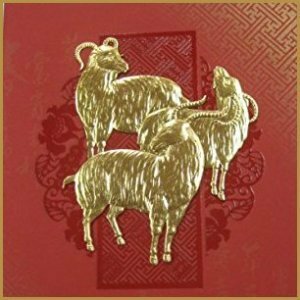 To be born in the Year of the Sheep, babies will have to be born from February 19, 2015 to February 7, 2016, the last day of the 2016 lunar year. If the baby is born on or before February 18, 2015, he or she will be a Horse Baby, if born on or after February 8, 2016, the baby will be a Monkey Baby. The next Year of the Green Sheep will be in another 60 years. Ok this year we got an easy one, only 6 strokes! More on the Year of the Sheep!! !